•If a child wants a carved jack-o-lantern, let an adult do the carving, or let the child use a knife especially designed for use by young children. •Use a small flashlight inside a pumpkin instead of a candle which may pose a fire hazard. •If a candle is used, light it only for short periods and keep it away from unsupervised youngsters as well as flammable furnishings. •In choosing costumes, keep safety in mind. Trick-or-treaters need to see and be seen. •If a mask is part of a costume, make sure it will not slip and cover the eyes. The eyeholes should be large enough to see through clearly. •Consider using face paints or cosmetics to create an original "mask". •Hats and scarves should also be tied firmly, so that they do not restrict vision. •Attach reflective tape or stickers to costumes or footwear and to Halloween treat bags so that they can be seen more easily by motorists. 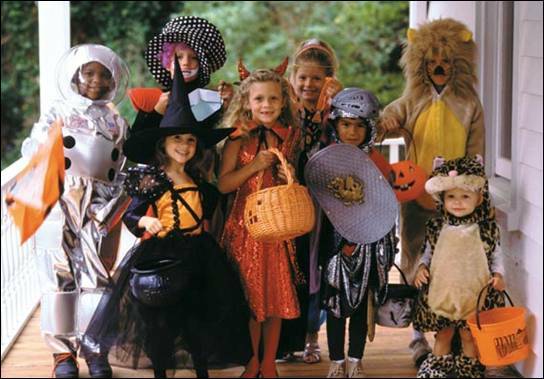 •Small children need a supervising adult with them when trick-or- treating. •Have children carry flashlights to light their way and be more visible to motorists. •Walk on sidewalks where available. •If children must walk on a road, walk facing traffic. •Trick-or-treaters should go only to houses where they know the residents, and where the outside light is on. •Children should stay on the porch or outside steps to get their treats, and NEVER go into a home without an adult. •For treats, parents should consider healthy options to candy. Healthful prepackaged snacks such as raisins, or treats such as coins, stickers, sports cards or coupons from local businesses are a welcome alternative. •Children should be warned not to eat any food until an adult has inspected it at home. Unwrapped treats and those showing signs of tampering should be discarded.